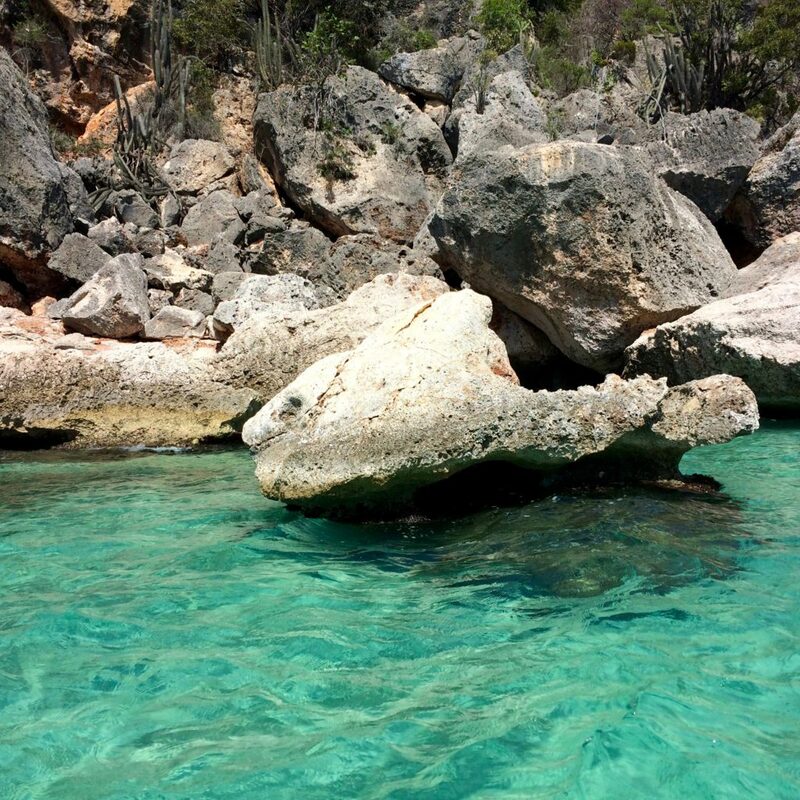 Exploring Barahona to Pedernales on the Haitian border is like driving west from the tropics of Florida and half an hour later entering the desert of New Mexico. Humidity and lush plantations give way to aridity and dusty cactus. The Sierra de Bahoruco casts a dark line across the landscape to the north and the Caribbean Sea on the south is no longer visible. 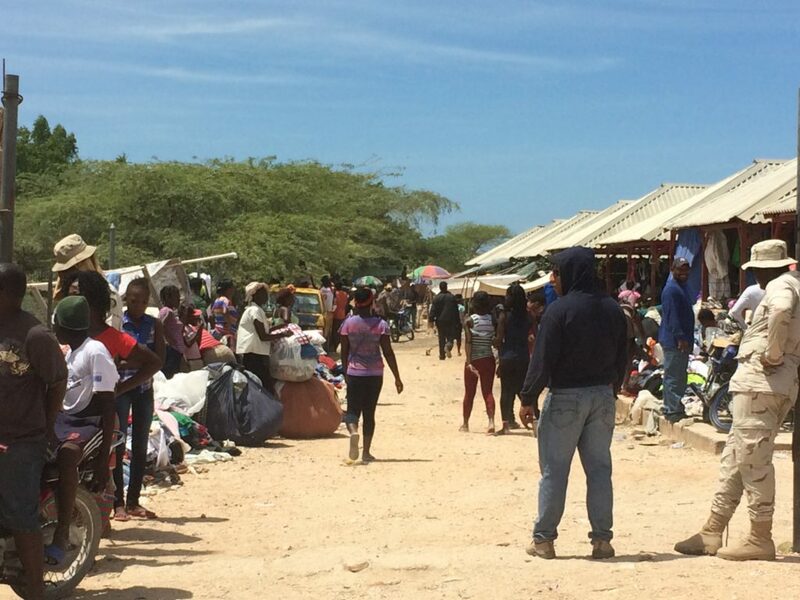 We’d heard about the Pedernales International Market located just before the border with Haiti and thought we might find some interesting goods with the promise of an intercultural experience. I suppose it was, in a way, but what we saw made us feel sad. There was the squalor of the town itself. Couple that with the apparent poverty of hordes of dusty people standing around the market stalls, which appeared to hold only Haitian stuff and Dominican stuff. I saw a huge trash-compactor type of truck packed with clothing that was rumbling toward the armed military checkpoint with Haiti. We had no way to enter the market milieu without being the focus of attention (even if it had been safe to do so), and as we drove away I felt acutely guilty for the affluence I enjoy. From there we drove south to the Bay of Eagles, a loose stack of Queen Conch shells marking the turn toward the park entrance. Lunch was surprisingly delicious. I had fresh seafood in an excellent sauce served inside a shell of mashed plaintain. I hadn’t developed much of a taste for plaintain, but that combination changed my mind. I’ll always remember that drowsy lunch with congenial friends under a palm-frond roof, the white sand and azure Caribbean Sea sparkling beyond. We hired a boat to take us along the rocky coastline. From time to time, small enclosures of white sandy beach would open up, which the guide called a “lover’s beach.” Incidentally, the bay is named for the shape of the landmass, not for any indigenous eagles. Some of us snorkeled and others climbed a lookout tower for a panoramic view. 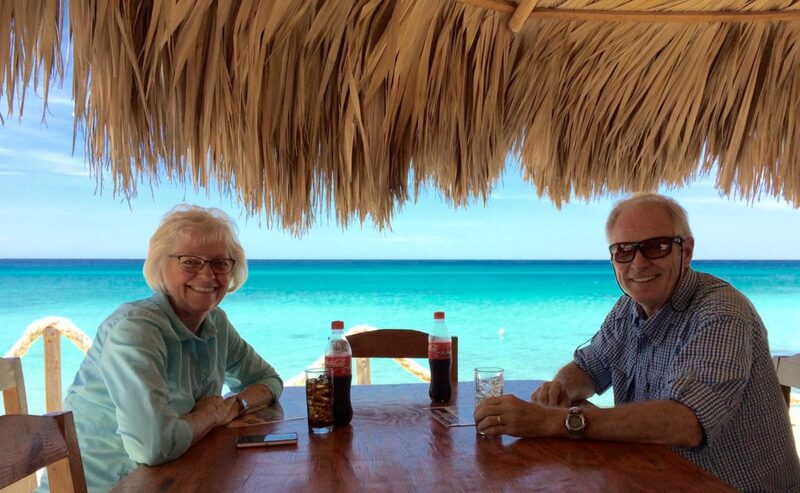 On this visit to the great southwest of Hispaniola we traveled with a professional photographer and his wife. I learned to see through his eyes how the gentler slanted rays of late afternoon change a subject, compared to the intense direct light of day. I also learned a new rhythm for watching that involves a lot of space between quiet and active. His wife was an “i-Phone-ographer” like my traveling companion and me, and the three of us had fun at photo-ops despite knowing we inhabited quite a different world from her husband and his professional-grade equipment. Earlier that morning we had stopped to view a saltwater lake, Laguna de Oviedo, in the Jaragua National Park, but the wind and strong morning light had made photography unproductive. 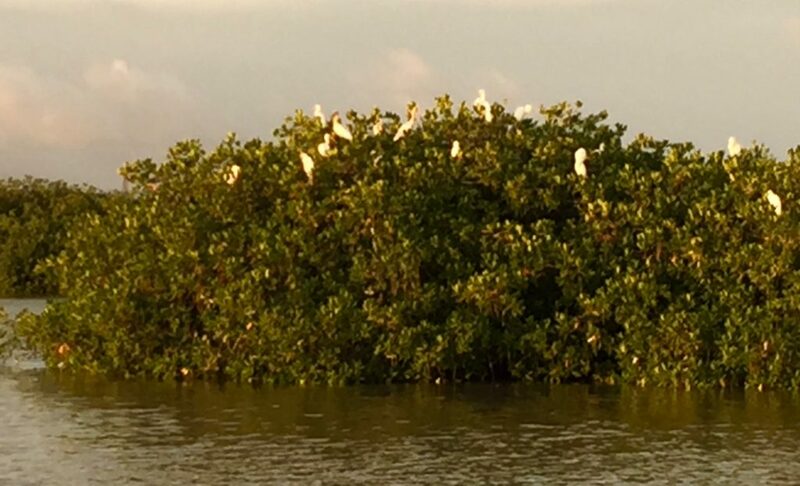 When we returned to the lagoon on our drive back from Bay of Eagles the light had softened, the wind was down, and the birds on the far eastern side of the lake were settling into their roost on the tops of the mangroves. We saw an abundance of mature and young flamingos, ibis, pelicans, and the great egret and snowy egret. Since I can’t swim, I always make sure I have a life jacket when I go out in a boat. The guide initially waved away my concern, but when he could see it mattered to me, he found us the equipment. We were all intent on sighting birds when we heard the motor stop. I turned back to see what had gone wrong. Imagine my surprise to discover the boatman walking the boat forward in silence through the water toward the birds. 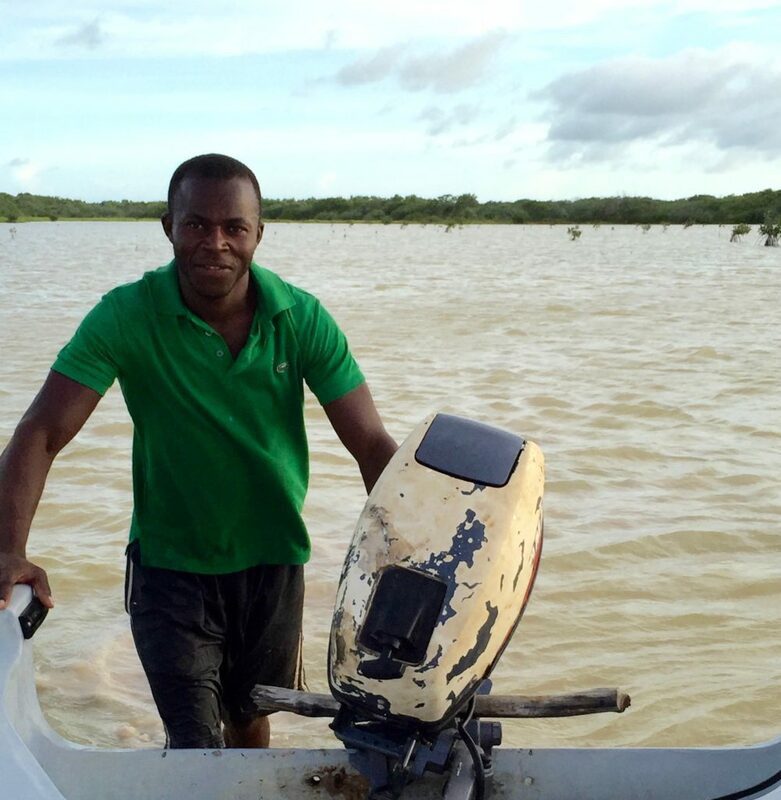 The lake was only a couple of feet deep – 9 feet at its deepest. Our guide told us that the lake is three-times the salinity of ocean water because of fissures in the bottom that allow the seawater to leach through the rock into the lake. Freshwater comes in from the Bahoruco Mountain Range, but there is no opening to the sea, which is just a few hundred yards of mangrove away. If we’d gone to the south end of the lagoon we might have spotted giant rhinoceros iguanas in the wild. But we’d recently seen them in pens at Cave of Marvels near La Romana, and the sun was setting. 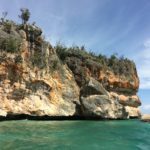 For more JMBryce Travel blogs about visiting the Barahona and Southwest Dominican Republic area, go to Sunrise over the Caribbean Sea, Beautiful Blue Larimar – Uniquely Dominican, and Itinerary for Visiting Southwest Dominican Republic. Well told! We loved our weekend with you. Yeah, we did it right!